Those mad geniuses at LEGO have unvailed yet another masterpiece. 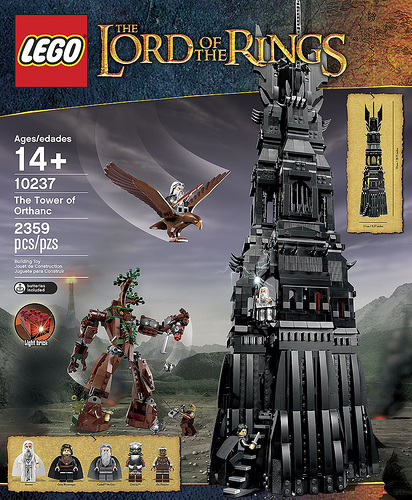 I’ve been gleefully putting together the smaller LEGO LOtR Sets, but now with the tower of Orthanc available… i might not have the discretionary funding to spare! This set comes with a 2 foot tall tower, Several minfigs, An Eagle, and an ENT! Yes a real build it yourself Shepard of the trees, as well as Gandalf the grey, Saruman the White, Grima Wormtongue, an Uruk-Hai, and a regular old Orc. All the baddies have the livery of the white hand. I’m loosing myself over just how awesome this set looks to be, and for only $199.00 and weighing in at 2,359 pieces. The Tower stands over 2 feet tall, the ent roughly a third of that and the included chambers and gizmos inside the tower are fantastic! unveils new 10237 Tower of Orthanc set: 2 feet tall, 2,300 pieces | The Brothers Brick | LEGO Blog.